I can’t believe I’m just now getting around to tell you all how cute and fun Bruges, Belgium is! But before we get to the adorableness, let me give a little bit of background. Back in June (oh so long ago – I know), my two friends and I hopped on the EuroRail from Amsterdam to visit Belgium for a long weekend. We went back and forth trying to determine which city would be most convenient, cost-effective, and worthy of exploration from the Netherlands. We had 3 days to spare and wanted to make the most of this journey. Dusseldorf, Brussels and Paris were all on our radar. We quickly eliminated Dusseldorf, as we heard it’s a small city and we honestly didn’t know much about it. I’ve been dying to go to Paris for a while, but I wanted to be sure to do Paris properly. I felt as though we would have been rushed the whole time and not get to see everything that Paris has to offer. It was also more expensive by train and a longer commute. So, Brussels it was! This excursion to Brussels was the most cost effective and closest from our destination. 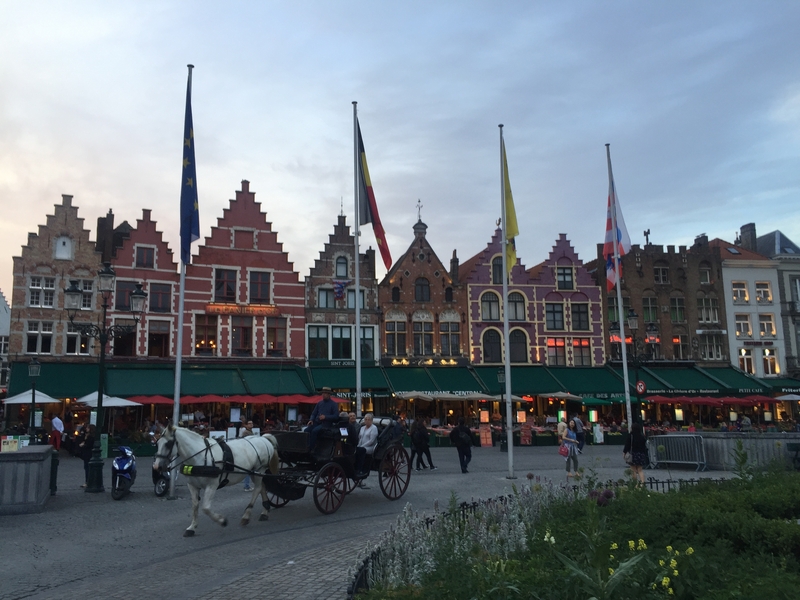 After doing our research and talking to friends that have visited Belgium, we heard of a town called Bruges that is a must-visit. 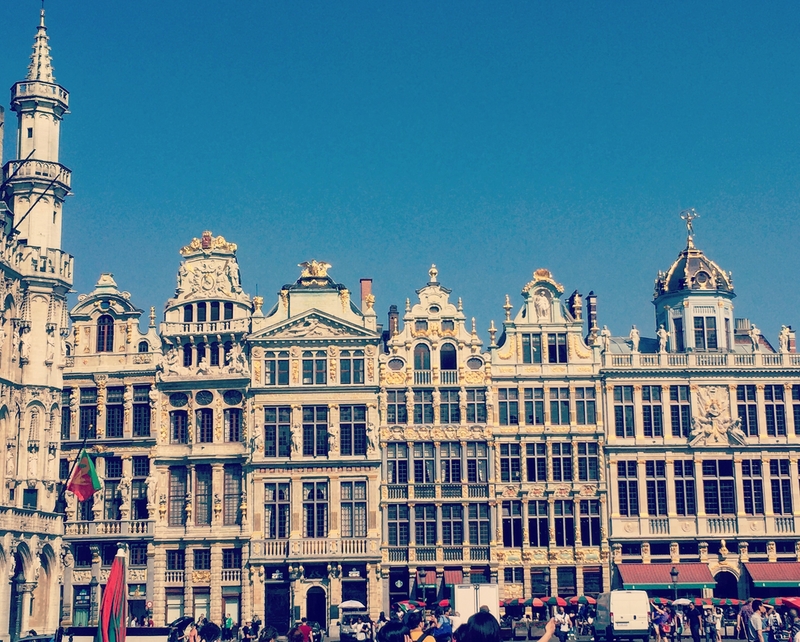 And it makes for a super easy day trip from Brussels – even better. So, that’s what we were all set to do. We got our train tickets for Amsterdam to Brussels to Bruges and back to Amsterdam. Our day and a half in Brussels was fun, trying the different Belgium waffles, chocolates, beers, etc. I LOVED the Grand Place. Our hotel was pretty much right around the corner from this central square, so it made for a convenient, yet noisy stay. While Brussels was a good time, I personally enjoyed Bruges MUCH better – so let’s get to that. 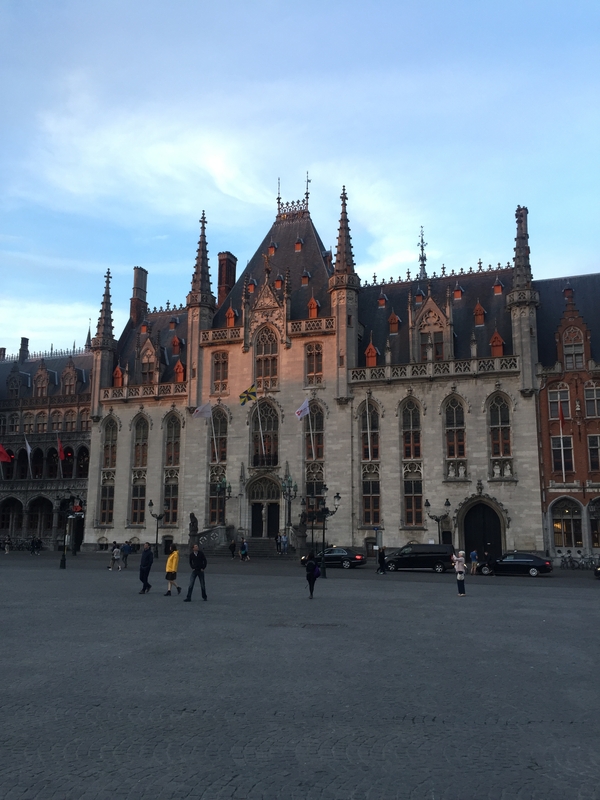 Our train entered Bruges in the afternoon, and we hopped in a cab to get escorted to our AirBnB. We got a great deal for a night in an awesome, spacious loft right near lots of restaurants. Bruges is definitely a walk-able city, so we made sure to highlight all the spots we wanted to check out in our one day/night in town. 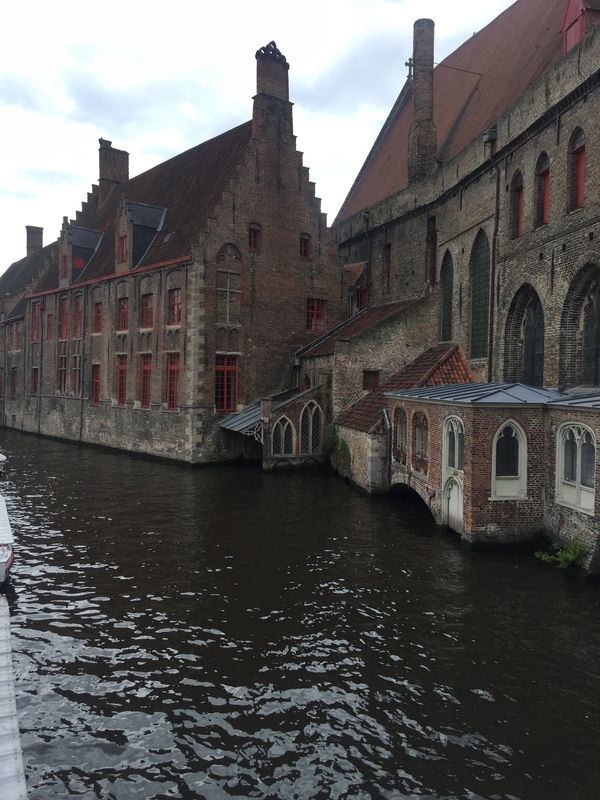 In order to see Bruges in a day, I highly recommend making a to-do list. 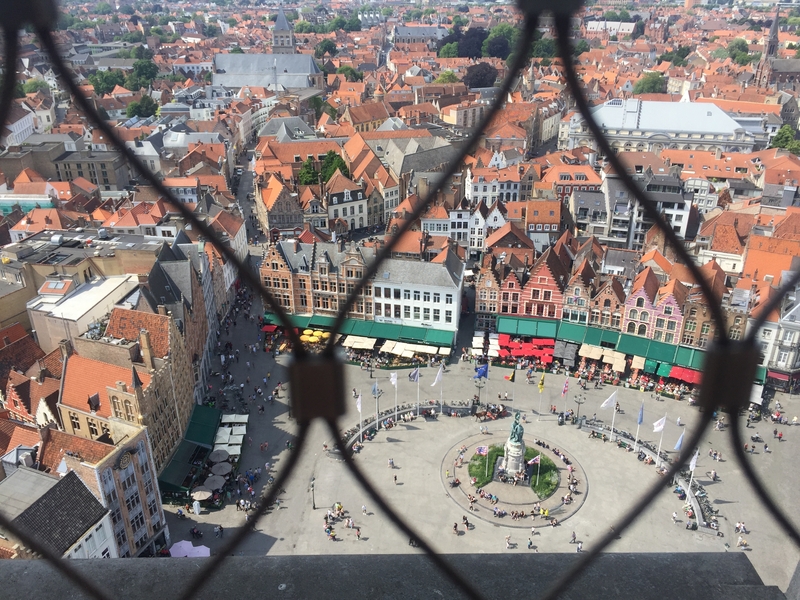 Buy tickets and head up the Belfry of Bruges, right in the city centre. This medieval bell tower was mostly wooden when it was founded in 1240. After it got struck by lightening numerous times, the stone tower was completed in 1822. The tower has 47 total bells, and 366 large stone steps to the top. The view from the top is outstanding, but you’ll get your work-out in to see it! At the very heart of Bruges and right below the Belfry is a beautiful and historical town square. I couldn’t get enough of it! Between the colorful, old buildings, the horse-drawn carriages, cobblestone pavements, and statues, I was really in awe. We didn’t eat on the square, but had a blast walking around, taking pictures and talking to the other tourists. Town Hall is also in the Markt. I thought the Grand Place was impressive in Brussels, but this building was just as astonishing. We just so happened to stumble upon the Bridge of Love, or the Bonifacius Bridge, which looks like a scene right out of Beauty and the Beast. There are places to sit on the bridge and watch the gorgeous swans swimming below. We spent a while here, taking pictures and soaking it all in. 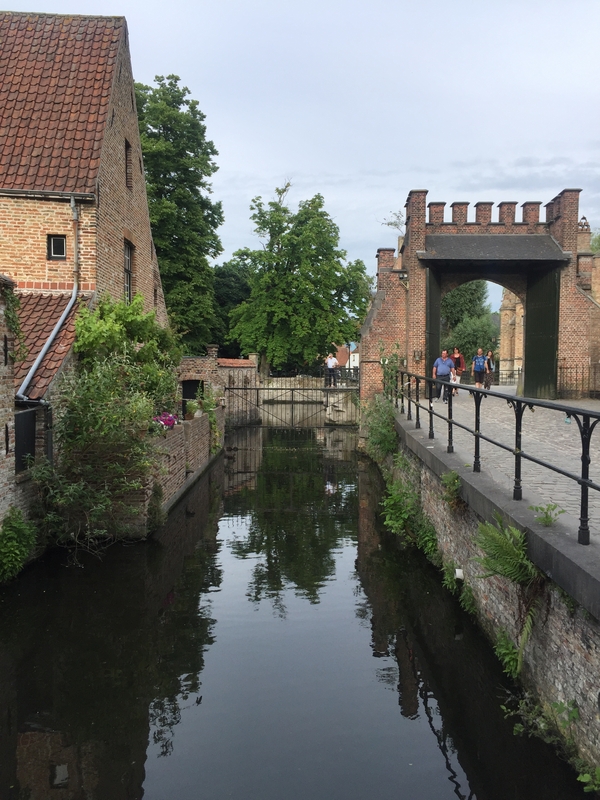 This isn’t the only picturesque bridge in Bruges, you will be sure to come across a few others in your adventure here. 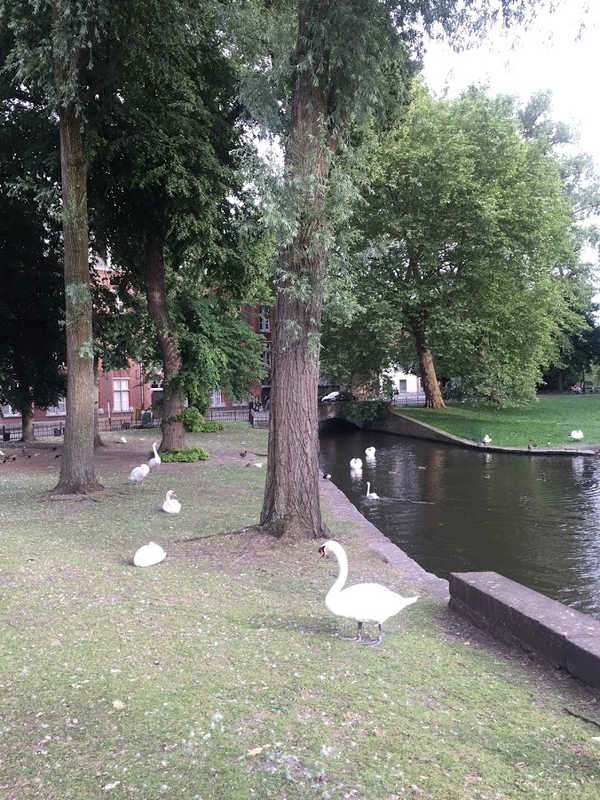 I was in need of a nature fix after being in big cities and around tourists for a week, and Béguinage was just the kind of greenery I was seeking. It’s actually perfect that you have to be quiet when crossing through this complex, as it still houses nuns. Think of it like a convent of sorts. PS. It was founded in 1245! 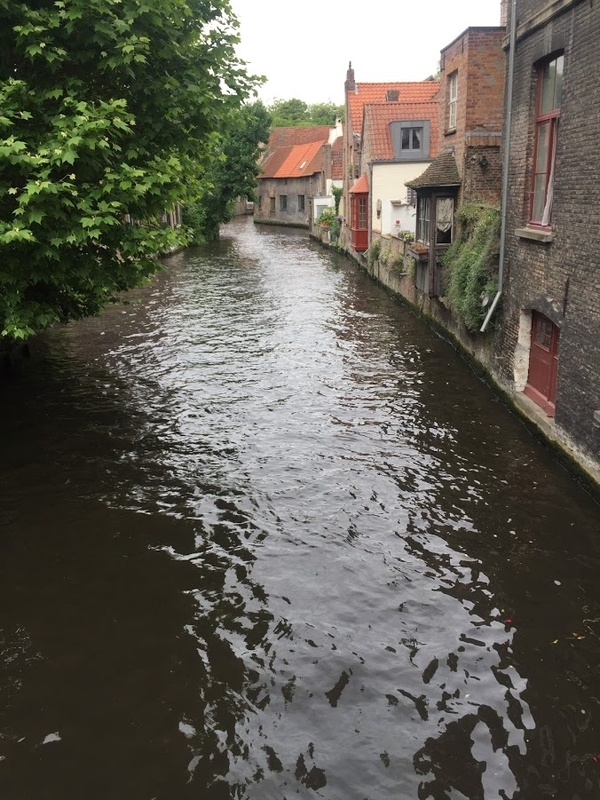 Just like Amsterdam but on a much smaller scale, Bruges has canals running through it. The orange rooftops on top of the old buildings along the water make for some great views. You can do a canal tour to see Bruges from the water, but we decided to walk and get our step count up instead. This obviously doesn’t need a description. All the chocolates are SO good. 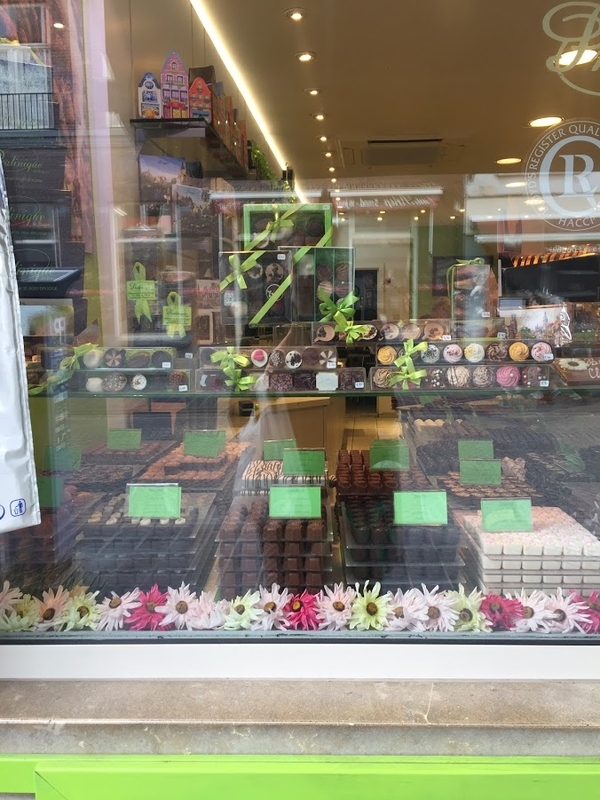 There are chocolate shops lining almost every street in Bruges, so be sure to pop in a few and let your taste buds have some fun. 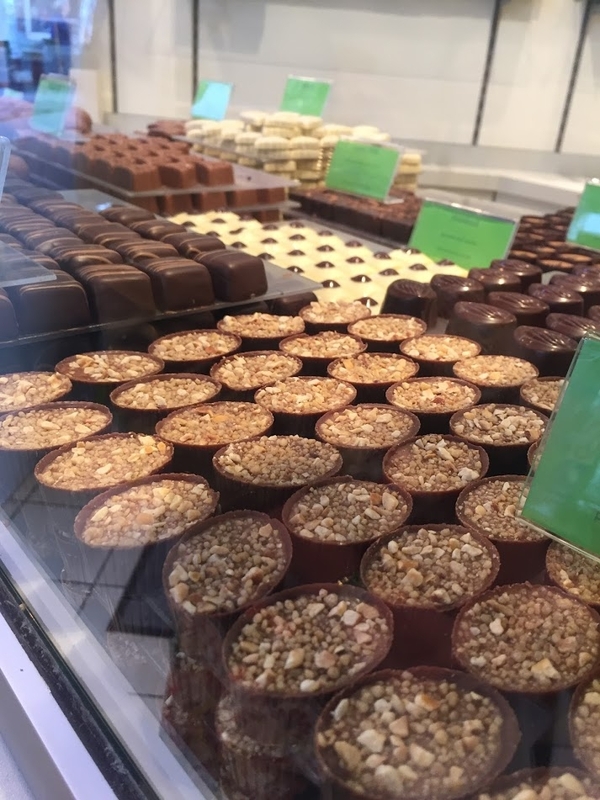 Chocolate also makes for great souvenirs for friends and family (if you can take it home before eating it all – a hard task for me). You see what I mean about Bruges being adorable? Your Instagram followers will be jealous! 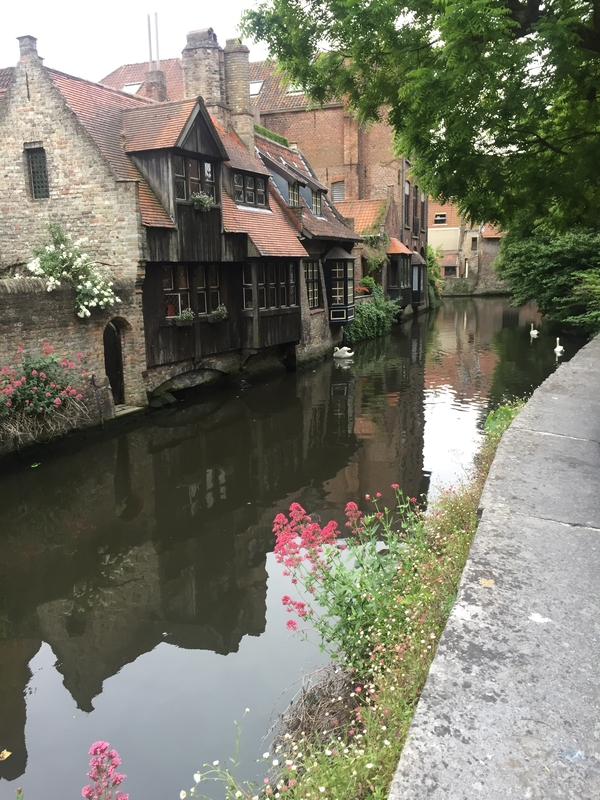 Bruges, Belgium also has such a refreshing vibe, and you should leave there feeling happy and relaxed. And possibly wishing you could live in this fairy tale land. Hats off to you, Bruges! Have you been to Bruges? What’s your favorite thing to do here? Comment Below!